Steve, can you please share with us your background before yoga? 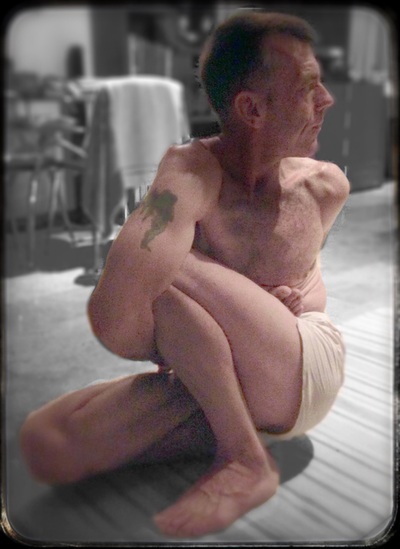 I’m almost 54 (already), and started yoga at about 39. Prior to yoga …. I was brought up by two loving parents and not interested in sports at all. I was more naturally inclined towards the music scene, and playing guitar with the dream of recording something that I actually liked myself. Anyway, that’s quite difficult to achieve. It’s the pot of gold at the end of the rainbow, but it’s fun searching. Anyway, in my youth people weren’t so nutritionally aware, and I was very overweight. In fact, when I was nine, I remember being put on the scales in a school medical, and being told by the iron-lady of a nurse that I shouldn't weigh that much, until I was 16! After a life of being tainted the Billy Bunter of the class for my entire school life, in my early mid twenties, I got anorexia, which is actually very rare for males. At rock bottom, my weight was down to 32kgs (should've been 70!). It was probably brought about by prolonged dieting to get down to the nominal weight for my age and height. I had dieted for so long, that my body had literally got used to eating too little. For people who get through it, the cure for chronic anorexia, is just like any of the series, that we know and love: IT TOOK TIME. As I gained weight healthily of course, it had to be distributed correctly via exercising. I tried weights, didn’t like it at all, and took to running. In running, I found what is often referred to as ‘the zone’. My mind would get quietened. Then, by chance I saw a DVD of two people doing the primary series together, and it was love at first sight. I knew that the grace and strength of their practice, was what I had been looking for. Basically, they were in 'the zone’, but the asana were a zillion more times interesting and beneficial, than counting lamp posts as I ran. I was sold. Did you then decide to practice to the dvd? Did you find the yoga as a stabilizing source as you focused on your health? No, I never really took to putting on a DVD, and piecing the first series together using media, in real-time. Even now, I only find media good for seeking out inspiration and the odd tip or two. 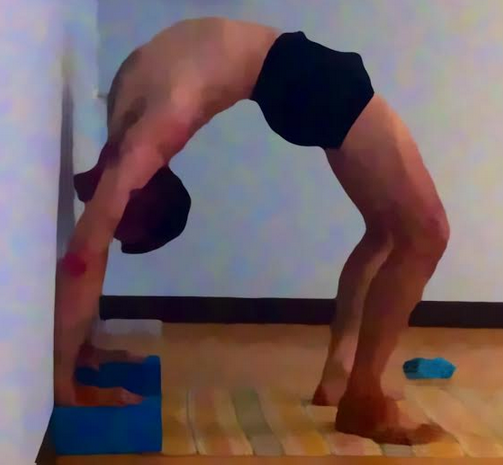 I had been to a few local bendy/stretchy type classes, where ‘lineage’ was not in their vocabulary, and would play around at home with some of the postures that have that initial ‘wow’ factor for most of us; padmasana and sirsasana.Within a couple of months, I’d superficially hurt my knee and then also tweaked my lower back, trying to lift into sirsasana. I wanted to try to find someone who taught Ashtanga, and see if a ‘community’ was anywhere within easy reach. What the DVD really did for me, was to refine my search for the method that floated my boat. (Don’t forget, there was limited internet back then). Regarding the health, a lot of time had passed between the peak of the illness, and finding yoga. By then, I was in my late 30’s, had a dreaded desk job, and my weight was within the correct range for my height. However, as I’ve heard a few people say, I still somehow didn’t feel comfortable within my own skin; still felt restless and, although I didn’t know it at the time, lacked inner peace & contentment. Anyway, I found a class, in nearby Oxford (UK). It was a led class, and as far as I remember, we’d go from start to finish all moving together through the first series, just doing our best and modifying where it was necessary. Mysore-style didn’t even enter into the post-practice chats, let alone the teaching. The teacher wasn’t authorized, but was very passionate about Ashtanga Yoga, taught it with conviction and was very inspiring. The right boxes were being ticked for me at that time. As time passed, I fell more and more in love with Ashtanga and the breath connection really started to change things for me, physically and mentally. I started researching a lot more, and thinking about it more and more, and it fired me up to find someone authorized and see how different it was. Then I got lucky. Really, really lucky. After a good bit of research, I teamed up with two of my best friends from the led classes, and we made a 90 mile round trip in and out of London every Sunday at dawn to Hamish’s place in Londion; Ashtanga Yoga London (AYL). This was an enormous gain for us, in terms of experiencing the essence of this wonderful practice. We were finally out of the footbath, and into the pool, or ocean even. The shala was (is) tiny. I think at most, about 15 people go through their respective series together, getting physical adjustments and whispered advice from Hamish (who was certified by Guruji, way back yonder) or the assistants, all of whom are authorized. Then, when they’re done, in comes the next body with a mat. It’s very much like the main shala in Gokulam, divided by ten in terms of scale. We were experiencing not only top-tier teaching, but also had transitioned from a led format, to Mysore self-practice. I was really comfortable with Mysore style because I’d been nurturing a home practice for quite a while now, so to then experience a Mysore room, morphed all that I had been doing into, what felt like, the right way ahead for me. I felt so unbelievably safe in that environment. Hamish fascinated me. He has so much experience of the practice, yet he’s just so nice and down-to-earth; not an ounce of ego. Like Sharath, he doesn’t actually say much at all, but knowledge just gets passed from him, to you as a relationship builds over time. Parampara in action. I guess it’s very much like the stories you hear about Gurus who would receive people who were burdened in some way. They’d seek him or her out, armed with an arsenal of questions and problems but, once in his presence, the whole lot kind of become insignificant; silly even. All the guru had done, was rustle a newspaper or something, and yet those present would leave feeling a million times better. In fact, in 6 years of those Sunday trips, we barely exchanged anything other than nods of recognition, a very reasonable fee, and asana adjustments, only when they were necessary. And new postures of course. There is one thing that I did learn from Hamish’s vast knowledge, that I would like to share. In fact, it’s in his super little coffee table book ‘Yoga Dharma’ …. “Do asana with no: shaking, sadness, pain or irregular breathing”. It’s simple, but now I’ve been teaching a while, I know it really is a golden tip from day one, until day one million. 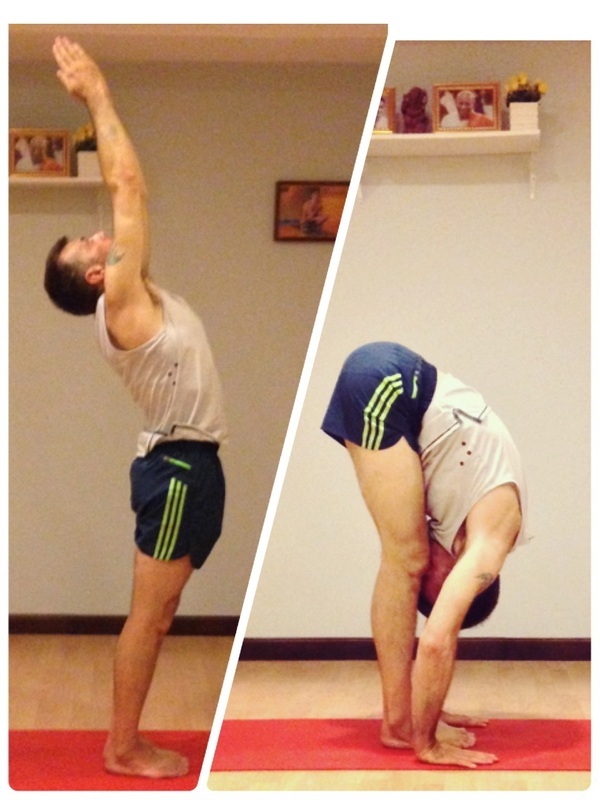 We over-stress our own bodies through trying too hard, moving ahead too fast, and then the cynics dust off that old “Ashtanga is a brutal practice” rubbish. It is, without an ounce of doubt, one of the most deeply healing practices available to us all, if learned correctly. When we’ve been practicing for a long time though, some things can creep up on us. For example, if we don’t alternate when we cross and jump back, things can get out of balance around the psoas, so we need to stay vigilant, listen to our bodies and ‘keep an ear on the ground’. Not literally though; I mean keep scratching around for tips. As those Sunday AYL visits progressed, I wanted to go deeper. I found work near London (another hip-destroying desk job), and could finally make it to a daily Mysore class. Looking back, one big thing I got out of that, was an appreciation for the beauty of Bhramamuhurta; those magical hours before dawn when all is still. I could get into the city when nothing else was on the road, get done, and get out. By then (7:30) all the commutes were stacked up on the inbound lane and I was cruising out, in my post-practice high. This kind of routine must be coupled with early nights though. Rest is so important. Outside of the practice, and the Shala though, UK weather, pressure of work and a general “where am I going?” sentiment kept making me want to instigate change. I guess it was your typical mid-life crisis. I was alone, and so I tried to turn that around, and see it as a positive thing. I could do anything I wanted. I sold pretty much everything that I had and headed off to a simpler life here in Thailand. To be completely honest, there were only two things that I missed; family (including close friends) and that Shala (including Hamish, Louise and all my practice buddies). Oh, and marmalade initially, but I’ve found a good one here now. As an aside, one other major observation came up when relocating. I had accumulated so much that I thought was ‘required’, but it was all really just excess baggage. So, don’t focus only on asanas guys. Asanas are our ‘doorstep’ but observe and abide by Aparigraha (non-possessiveness), and all the other elements of the Yamas and Niyamas. I personally, frequently kick myself for leaving those aspects to gather dust for the first decade of my practice. I stepped around the Yamas and Niyamas because they didn’t seem to be available as bullet-point reminders, and I just didn’t have time back then for the scriptures. However, in ‘Astanga Yoga Anusthana’ Sharath summarizes them beautifully, and they’re very easy to internalize and meditate on. I hope, so much that he finds the time and inclination to go to print on the other five limbs in such a succinct manner. “In the first week (at least), don’t do anything other than practice, eat and rest”. I kind of half-listened and burned out in the first trip, because I wanted to fly around all day seeing and doing things, as well as practice. I never do that now. Since getting authorized, I’ve been able to assist Sharath for a couple of trips, so I’m pretty worn out after a 4:00am practice, and a couple of hours helping out. When I transitioned from Hamish and Louise (Newton), to Sharath I had no idea what to expect. My very first teacher had given me an early (incorrect) impression that Sharath was strict in a scary way but, in fact, I just love him to bits. He’s very kind, but strict in order to be organised, and unbelievably knowledgeable. Both Sharath and Hamish, who I regard as my principal teachers, say a LOT when they say a little, but that works for me; it’s easier to retain. Physically, I had the same uncertainty also but, when Sharath was teaching me Kapotasana, it was like some kind of magic spell. Quite unlike physical adjustments I’d had in the past. I’m sure you’ll know what I mean, if you’ve been there, or felt it else where. If not, go there as soon as you can. Your description of Hamish’s shala, the tiny space, reminds me of stories of Guruji’s old shala in Lakshmipuram; whereby the small number of focused students coupled with the Teacher’s intense attention builds a pressure cooker environment for practitioners. Did you find this the case? Yes! Good analogy. Even from the outside, it’s no bells & whistles. Just a small sign, and totally inconspicuous among the other buildings in that street. I never went inside the Lakshmipuram Shala, but I’ve visited the street. Lakshmish (Sharath’s chanting and Sutra teacher at the main Shala) lives there now. Same protocol inside the London Shala too. The wall’s breathing, from start to finish, and people quietly waiting for their turn, to the “one more” queue. When I say it’s small, I’m talking about the main practice area. After back-bending, students move their mat into a separate finishing room, so it’s a superbly efficient way to use the space that is available. So, yes, probably a really good parallel would be Lakshmipuram, except Guruji never needed radiators to keep the English weather from spoiling the fun. There’s a saying that a student will often find the teacher that he or she needs at the time of instruction. You were taught the foundations of the practice before having the good fortune of finding a teacher certified by Guruji. Was this the case for you? Yes, that’s a nice positive slant to put on it actually. I’ve often thought that I didn’t learn “properly” because I went along to those early local classes, knowing very little, and jumped right into a led primary format. It hurt. 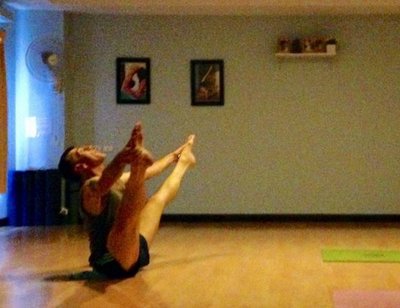 For 2 or 3 years, areas of the practice really used to hurt, because I hadn’t yet learned that I should back off, breathe and let the asana and breath open me up and fix me. I’ve often contemplated over how much nicer it would’ve been to learn from the Salutations, and add to it little by little, but when we’re starting out, we usually want to be like everyone else in the room. When we start breathing and moving, all we see around us is perfection and we want to be a part of it. It’s different once you can get your head around how Mysore-Style works. So, so clever. Guruji was an absolute genius coming up with that, as a vehicle for transmitting the asanas to so many people, all of different constitutions, at once. 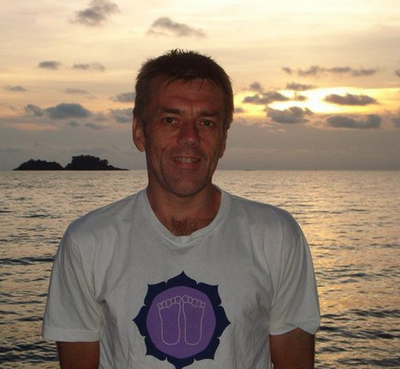 Steve, you spoke at length about the Yamas and Niyamas and the importance of seeing beyond just asana. Can you share about how you might discuss cultivating the practice off the mat to a student? As I mentioned earlier on, I was very late realizing this myself, but I can’t change my past. If we go beyond asana and begin to appreciate that the Yamas and Niyamas help us to reprogramme our nervous system, it might start to wipe a little bit of the dust off of our mirror (to use that old cliche). ‘When we think about sense objects, attachment comes. Attachment breeds desire, the lust of possession. If desire is thwarted, it gets confused and anger can arise. Anger clouds the judgement, and we no longer learn by past mistakes. Life ceases to have meaning’. That’s just the tip of the iceberg but it can help us so much to live our lives lightly, if we internalize it. Aparigraha (non-possessiveness), Santosha (contentment), even Asteya (non-stealing) all become active forces in our life (practice). When/if we start to build this into ourselves, it seems logical too that the asana experiences change for the better, because of the interaction between the physical body and what’s beneath. The universe(ity) of yoga invites us in. Can you share your experience/honour of assisting Sharath in the Shala? That took me by complete surprise, because I hadn’t realised that I was going to be told to do it. Then, after a few breaths, I thought to myself “well, getting the blessing to teach this method, is about assisting out there in the big wide world really, so this is the best opportunity to get going with it”. Assisting in the process, the parampara, in order to keep this wonderful practice intact, and not let confusion set in, right? At that point in time, I wasn’t running a Shala, so not working with bodies regularly (even now, we don’t have a full Mysore programme, but we are moving in the right direction); So, it was a bit scarey initially. Back then, I was just teaching my wife, and had taught some led classes from time to time (Note to self: vinyasa count needs work). Of course I have received many helpful adjustments over the years and researched adjustments out of interest ... svadhyaya. Mainly though, I set my own rules of engagement; Work with the breath and, if someone wanted help with an asana that I don’t do, I delegate. Of course Sharath watches like a hawk. You can’t stand around if help is needed somewhere, and you definitely can’t do anything that isn’t correct. First time round, I felt like a humble dormouse amongst all that breath and muscle, and especially by day 4, I’d be very tired from my own practice. Seemingly endless shifts of people come through, and many need help with Marichi C & D, Supta-kurma, Supta Vajrasana, drop-backs etc. There’s plenty to do. You come across all of the personality types, albeit briefly. Hmmm. We are a varied and complex species. Outside of it all though, we should do all that we can to spend time with our guru, even if it means losing the use of your arms for the rest of the day. It was, as you rightly said, a real honour. You mentioned that you took a risk, sold most of your belongings, and moved to Thailand. This allowed you the opportunity to make yearly visits to visit and practice with Sharath. Ashtangis tend to shift their life to accommodate this practice. What do you think draws them in so deeply? To be clear on that, I should point out that the practice wasn’t the primary driver in those decisions. There were a number of reasons that I wanted to implement some big life-changes at that time. Many of them relate to yoga, but not specifically the Ashtanga practice. I wanted to lead a lighter, more simplistic lifestyle, and preferably one with a lot more sunshine. Lean towards being more sattvic, consciously through practice, but also (or eventually) subconsciously. Perhaps yoga draws people towards that scenario. Ashtanga can pull you that way quite strongly, because it’s not a mild practice. If you prefer a mild practice, expect a mild result. As David Swenson said though, “Don’t let yoga ruin your life”. At 54 and recently authorized, do you find that your age is an advantage in teaching Mysore style? Particularly in relation to folks finding the practice after their 20s and 30s when their physical bodies might not be as open as they once were? I’m really not sure whether my age is making any difference at all to teaching Mysore style classes, or the foundation classes that we run (we teach some “mini-led” classes to get beginners appreciating the benefits of the standing postures, and a short finishing sequence). I just feel that I need to do as much teaching as I possibly can, in order to get better at it and, of course, I wish I had more years ahead of me, in which to do that. I am drawn towards the healing potential of the Ashtanga practice whereas when I was younger, maybe I would have been less appreciative of that. I’m only authorized to teach primary, but in doing so, it has been a really, really nice experience so far. A lady who used to stay indoors, I think, since her husband died, is now really bubbly, outgoing and friendly with the other students. Another lady was very pale and weak, after quite a serious operation. In 6 months, she’s much, much stronger and looks very well. Another regular student has seen improvements in a life-long asthmatic problem. All of this has come about in their first year of practice. I hope they keep going. Can you share your first experience visiting India and practicing in the Shala? Yes, my first trip was 2009 so Guruji was still with us however, he was very sick at that time. Somehow, Sharath was managing to keep things going. Presumably, for that reason, I remember doing eight or nine led primary classes in a row before getting to experience the magic of practicing Mysore style in that room. So, to be honest, I wasn’t really liking it too much for the first few days, from a practice standpoint. Led classes have their place and purpose, but I was used to Mysore style on a daily basis, back in London. They soon passed though, and when we were told to revert to our Mysore start times, it began to feel like what I knew. There were only Saraswati and Sharath, and no assistants but they still worked their magic and, somehow appeared to cater for everyone. Having assisted a couple of times, with four or five others, I’ve no idea how they managed to do that because, as usual, the Shala was full at all times. I enjoyed each and every practice. The experience there is probably heightened by the fact that you are free of any work or family dharma, and can really focus on the practice, plus the room itself is steeped with the spirit and history of yoga. Anyone with a passion for this practice will feel at home and you’ll likely see many friendly, familiar faces. I remember being in the washroom getting ready for practice on that first trip, and finding myself right next to David Swenson; a voice I always like to hear. Gokulam itself is a quaint part of India. It’s in its own gear and doesn’t really get hectic at all. You can walk anywhere to do your stuff, but it’s also easy to get rickshaws, buses or rent a scooter. The restaurants and local people are really nice and nobody should ever feel anxious about spending time there. I, personally, always get a bit homesick because I miss my wife, but other than that, it’s a car-horn invaded paradise. It’s very difficult for most people to forge an opportunity to put life on hold, and go to Mysore for a month or more. If anyone reading this feels deprived or disheartened by this though, they shouldn’t. It’s a wonderful experience, but putting the mat down, wherever you are, every day is what will leads us to where the nectar really is. Any final words about the practice? Quite a few, as I’ve really enjoyed reflecting on all this is writing. Thank you for the opportunity and I wish you every success. I can’t wait to read the thoughts of others who contribute here too as, I guess all our scenarios are quite different in this crazy world. When seeking out the cause of discomfort or pain, don't look at the asanas or the asana practice as being the cause. That's your teachers job. The pain and discomfort is most-likely a message. Give first consideration to what you do everyday, without thinking about it and consider tweaking that habit. Do you stare at a smartphone too long and/or too often?, do you wear sensible shoes? get enough rest?, drink enough water? etc. When you enter into a doubting phase; have faith. When challenged by despair, revert to hope, but keep going. Spend as much time as you are able to, with the teacher that works for you and, svadhyaya (self-study) Of late, some great teachers have produced work that gives light & clarity on the method (all 8 limbs) and the ancient scriptures. Don’t underestimate home practice. But, "Vande Gurunam, switch off all devices". Enough said. We are what our deep, driving desire is. As our deep, driving desire is, so is our will. As our deed is, so is our destiny. In closing, it would be nice to pop right back to being 9 years old, on the scales, in front of that brash school nurse. With enough foresight I’d have said “No problem. When I’m 54, I’ll be dropping back and coming back up at 6.45 every morning, and it’s going to carry me through each day”.